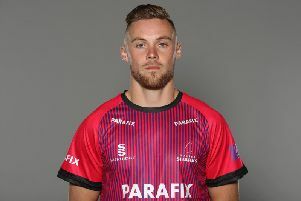 Sussex skipper Luke Wright is confident his side can still qualify for the knockout stages of the NatWest T20 Blast despite back-to-back defeats. Since winning three of their first four games the Sharks have had two matches washed out before losing to Gloucestershire on Sunday and Kent on Thursday night, when they lost by ten runs chasing a target of 167. But they remain in the top four ahead of tonight’s (Friday, July 1) home game with third-placed Middlesex at Hove. Just five points cover eight counties in the South Group. Wright said: “We had such a good start to the group with those three early wins but losing two games to rain meant we lost our momentum a bit. Wright was delighted that Sussex restricted Kent to 166 for 6 after they had been 97 for 0 in the 12th over, but no one gave Ross Taylor, who top scored with 49, the support he needed in the run chase. The positives for Wright were the performances of his bowlers, notably Tymal Mills who again regularly touched 90mph in front of the Sky TV cameras and will surely get his chance for England in next week’s T20 international against Sri Lanka. Sri Lankan Nuwan Kulasekara, who was playing the first of three games as a short-term overseas signing, also impressed. Sussex will have to make one enforced change tonight. Chris Jordan has returned to the England camp ahead of the one-day series finale against Sri Lanka. His place will go to either left-armer George Garton or leg spinner Will Beer. Tomorrow (Saturday) Sussex switch their focus back to the Specsavers County Championship when they take on Glamorgan at Hove. Although they remain unbeaten after seven games, Sussex are 37 points behind leaders Kent albeit with two games in hand. Wright said: “There is still plenty of time to make an impression on the season but it has to start soon and we have to start playing better cricket.